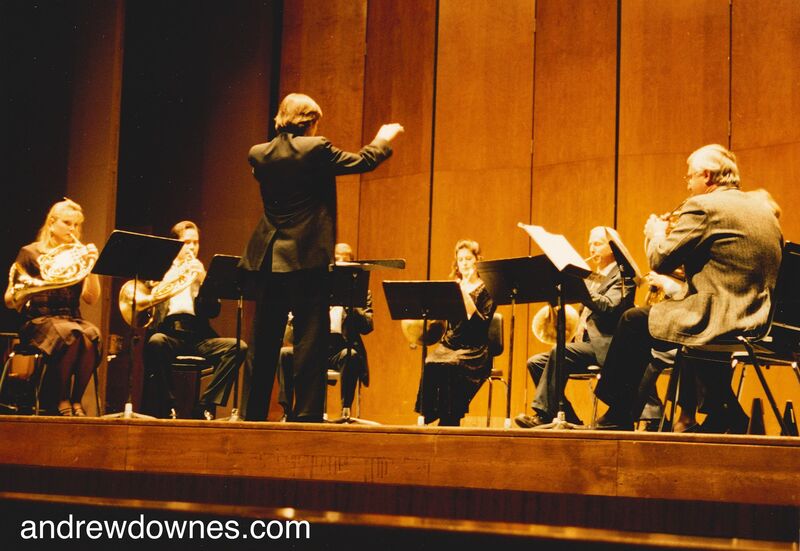 Have you performed in any of Downes' Horn works or come to watch? Please share below! Most of Andrew's commissions for horn were brought about by one man: Dr James Lowe, physics lecturer in the UK and the USA and fanatical horn player, who studied the horn with Andrew's father, Frank Downes. 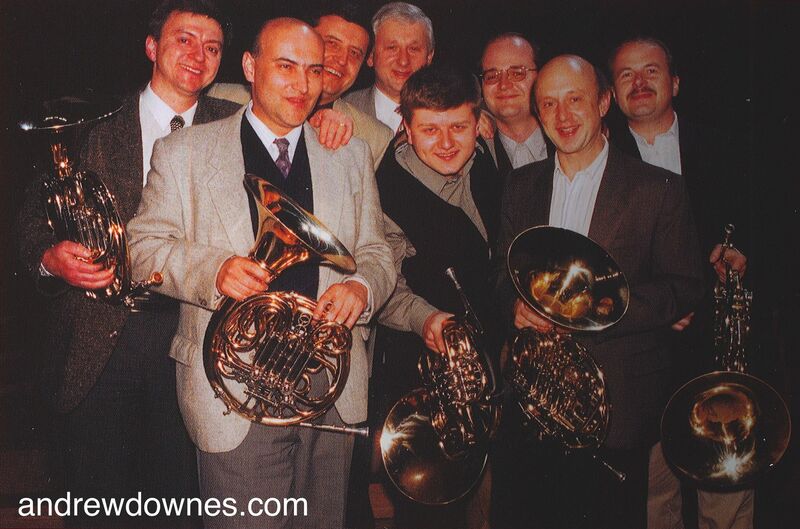 In 1981 Jim Lowe got the backing of the British Horn Society to commission Andrew's Sonata for 4 Horns. Many years later, Jim took up a physics post at the University of New Mexico and quickly established a horn octet there. He was behind a composers' symposium which was held at UNM and invited Andrew to be one of the featured composers. Jim, with help from the British Horn Trust and Janice Lee Sperling MD, commissioned Andrew to compose the Sonata for 8 Horns for the UNM Horn Octet to play at the Symposium. Andrew really wanted me to go with him to this Symposium, at which his Sonata for 4 Horns and his song cycle, Songs from Spoon River, were also going to be performed. Anna was 18 at the time and Paula 15. I thought I could safely leave them for the 10 day trip, particularly as their grandparents were not far away. I naively didn't expect parties, but was misguided in my trust. Anna's friend, Katie, moved in for the duration (with hindsight, I was glad of the added security of an extra person with parents nearby) and many gatherings were held. Paula proved to be the less wild one. She kept hoovering up around the friends, to the extent that one of them said: "I don't feel very welcome..!" Paula also asked some friends over. Word got out and her whole class were threatening to come. In the end, she had to go out and lock up the house. Meantime, in New Mexico, all was going well. 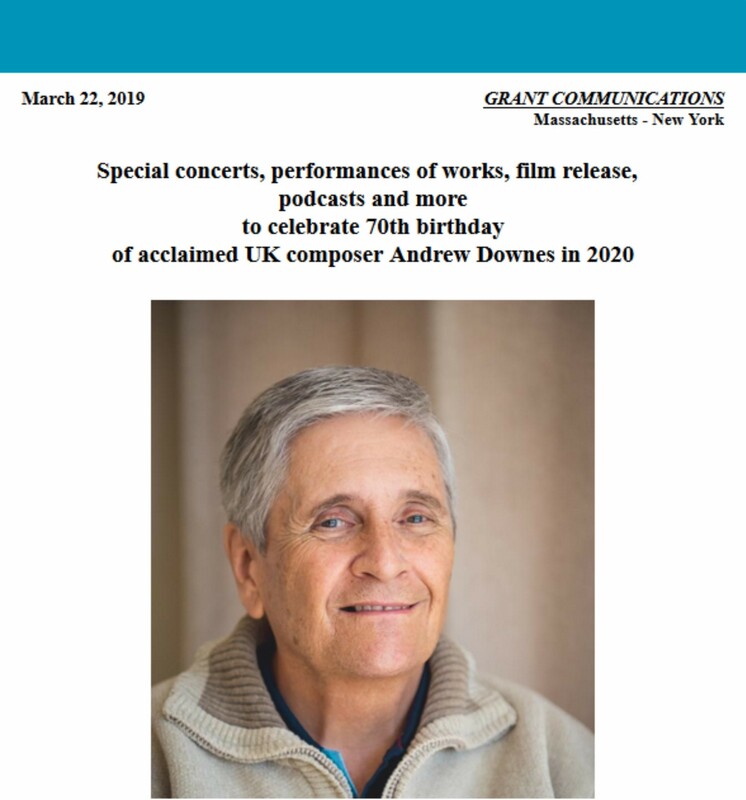 Andrew gave talks, took part in discussions, attended rehearsals and was delighted with the performances of his music in the University's Keller Hall. Jim and his wife, Margaret (flutist, who commissioned all of Andrew's works for flute choir) took Andrew and me round New Mexico in our spare time. We saw the beautiful Sandia Mountains, the Rio Grande and the unforgettable Chihuahan Dessert, where every rock is sacred to the Pueblo Indians. Unforgettable was our trip up to Sky City, a Pueblo Indian settlement, which is constructed on top of a small plateau and is so well camouflaged, it is invisible from the road. We saw their fascinating architecture: buildings made of mud with wooden beams protruding and external ladders to reach the upper floor. We had demonstrations of their pottery making. And we were introduced to their Native American flute. Andrew bought one and was inspired to write his Concerto for Native American Flute for it and to use it in his 4th symphony. The world premiere of Andrew's Sonata for 8 Horns went superbly. It was very well received. One audience member said to Andrew: "That is a major work!" The difficult first horn part in the Sonata for 8 Horns was played by Stanislav Suchanek from the Czech Philharmonic Orchestra. Stanislav was a visiting horn professor at UNM and was so impressed by the Sonata, that he took it back to the Czech Republic and performed it with his colleagues from the Czech Philharmonic Orchestra in a concert in the Suk Hall of the 'Rudolfinum' in Prague three years later. Andrew and I had visited Prague (with the Staffordshire County Youth Orchestra ) in 1966, when it was behind the Iron Curtain. At that time the beautiful Old Town Square and its shops were virtually empty. Andrew and I were very excited and keen to see it again in 1998. It was still quiet, but gradually 'emerging' from its Communist past. Everthing was very cheap, especially the restaurants. Each time we went back to Prague for performances of Andrew's music over the years, the tourist numbers and the prices gradually increased. The Rudolfinum is amazing. It is situated on the banks of the River Vltava and looks a bit like the Albert Hall. There are 2 halls inside, the Dvorak Hall and the Suk Hall. The decor has old fashioned elegance and the acoustics are very special. We could not believe how flawless and totally electrifying the Czech horns' performance of the Sonata for 8 Horns was in the Suk Hall! 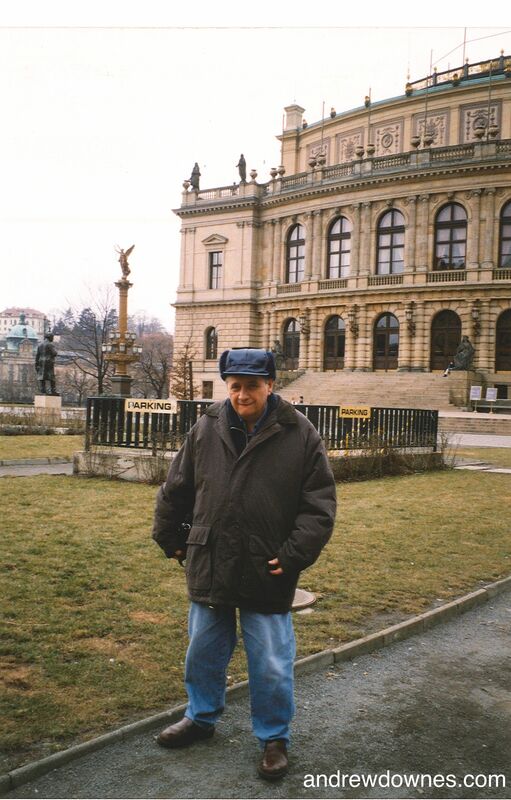 Andrew Downes outside the Rudolfinum, Prague. Immediately after this Prague visit, Jim Lowe organised, in Vienna, a thrilling horn choir performance of Andrew's Sonata for 4 Horns by the Vienna Horn Society. We had a wonderful time in Vienna, one of the highlights being an invitation from Roland Horvath, horn player in the Vienna Philharmonic Orchestra, to the sumptous Vienna Philharmonic Ball! Still in 1998 the horn players of the Czech Philharmonic Orchestra recorded Andrew's Sonata for 8 Horns for Czech radio and in 1999 for CD. The first horn part in these Czech performances of Sonata for 8 Horns was played by the phenomenal Radek Baborak (in the centre of the picture below), who was, shortly afterwards, poached by the Berlin Philharmonic Orchestra. Tragically Radek died at a young age. One of his legacies will always be his wonderful playing in the Sonata for 8 Horns on Andrew's CD. Radek Babotrak, Stanislav Suchanek, Jan Musil, Lukas Korec, Zdenek Divoky, Jan Voboril, Jindrich Petras, Jiri Havlik. Jim Lowe was also responsible for commissioning Andrew's Sonata for Horn and Piano and his Suite for 6 horns. These, together with the Sonata for 4 Horns, were recorded for CDs in Vienna in 2001, Jim Lowe playing in all 3. Following on from the Czech performances of his Sonata for 8 Horns, Andrew composed his Sonata for Brass Sextet, his Concerto for 4 Horns and Symphony Orchestra and his Five Dramatic Pieces for Eight Wagner Tubas, all for the Czech Philharmonic players. As a result, we went to more wonderful performances in Prague (when Anna and Paula were older!). In 2008 the horns of the Czech Philharmonic Orchestra recorded Andrew's Sonata for 4 Horns, his Suite for 6 Horns and his Five Dramatic Pieces for Eight Wagner Tubas for a CD dedicated to the memory of Andrew's horn player father, Frank Downes. The story of the horn ensemble works thus came full circle! After Radek Baborak, Ondrej Vrabec became principal horn in the Czech Philharmonic Orchestra. 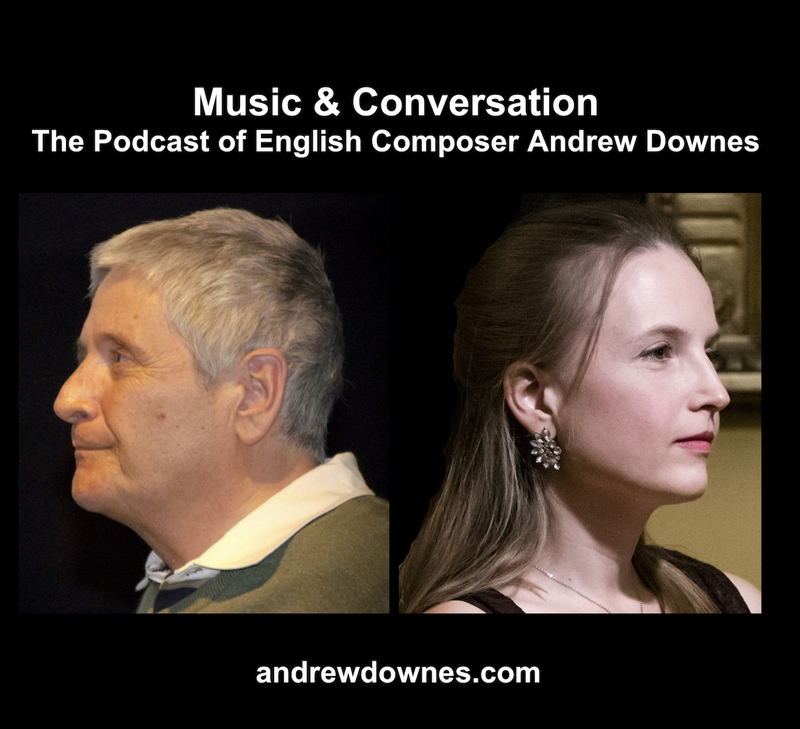 Andrew composed a Concerto for French Horn and Symphony Orchestra for him, which he premiered to a packed Birmingham (UK) Town Hall in 2012, in a concert organised by our daughter, Anna, with her orchestra, the Central England Ensemble. I led the violas in the orchestra for the performance and was thrilled and honoured to play the 2 small viola solos in the work. Andrew completed this work after he had spent 9 months in the Spinal Injuries Unit at Stoke Mandeville Hospital. 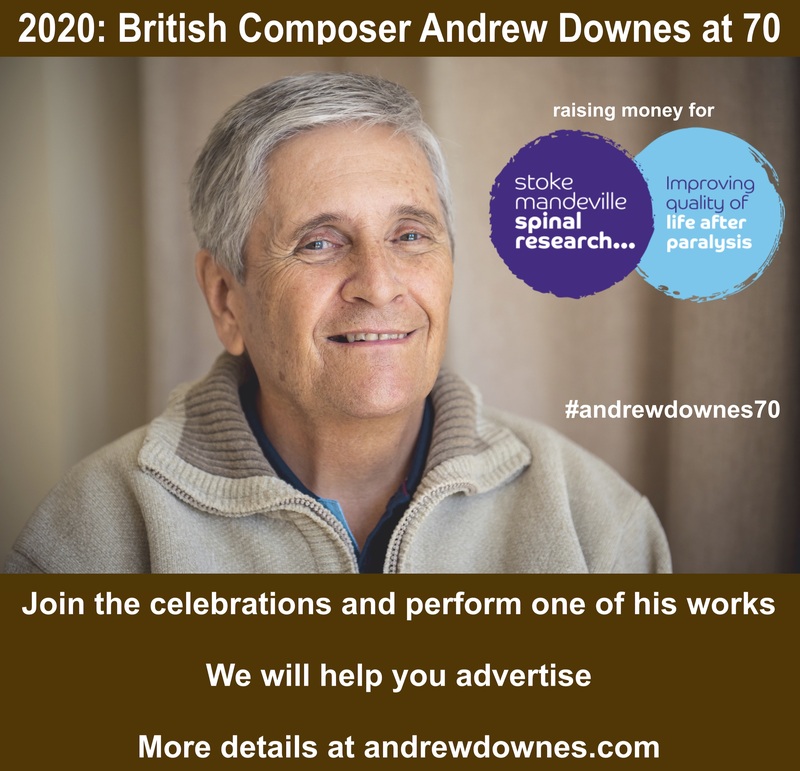 When Andrew broke his back, I wondered if he would compose again. I was delighted when he continued with this Concerto, which he had started before his accident. Ondrej Vrabec became Associate conductor of the Czech Philharmonic Orchestra and recorded Andrew's 4 Symphonies and 2 Overtures on 2 stunning CDs in 2015. Our travelling days were over, but the recording, which happened in the wonderful acoustics of the Dvorak Hall of the Rudolfinum could be streamed into our home through our computer!